Earn $44.99 in Rewards credit (4499 points) What's This? 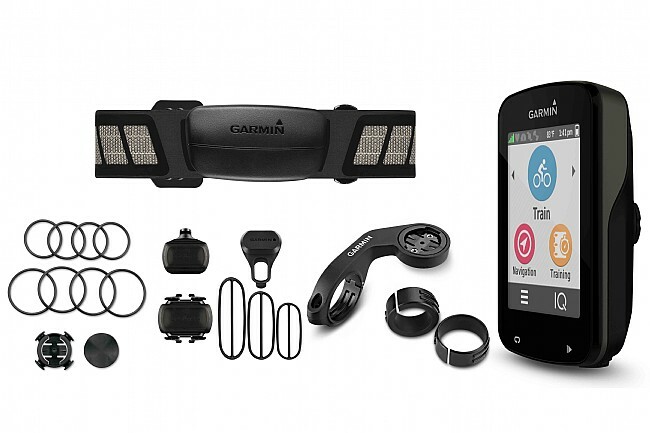 If you want all the mapping capabilities of the Garmin Edge 1000 and then some but don't want to add all that real estate to your handlebars, then say hello to the Garmin Edge 820. 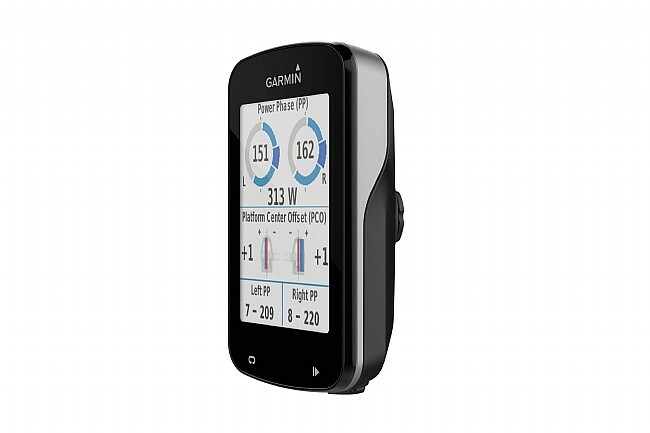 It packs a 2.3" color touchscreen and advanced mapping functions into a unit that's the same size as the the compact Edge 520, and this bundled version also includes a heart rate chest strap plus speed and cadence sensors to take advantage of all the advanced cycling metrics the Edge 820 has to offer. The pre-installed Garmin Cycle Map gives you turn-by-turn cycling-specific navigation, address search, points-of-interest, audio prompts, and even a round-trip Course Creator that will design a custom local route based on your preferences for length and difficulty. ANT+, WiFi, and Bluetooth connectivity connects to your power meter, external cadence sensors, and Garmin Varia™ devices, along with allowing text, call, and other notifications when paired with your smartphone. It also makes possible Garmin's GroupTracking feature that allows other Edge 820 users to join together to show you their real time positions, useful for keeping track of where your friends are at when you blow them up on the climb, or for locating the exact position of a group ride so you can seamlessly join up like a pro. Advanced performance metrics include VO2 max, recovery advisor, FTP, performance condition, stress score, and other cycling dynamics when used with a heart rate strap, and power metrics include left-right power balance and power phase for checking the smoothness of your pedal stroke. Strava Live Segments lets you see how you're faring against KOMs and PRs in real time if you have a premium Strava account, and while paired to your phone, built-in incident detection can send a message to an emergency contact in case of an accident. Taking in all this data is easy with the 2.3" high-resolution color touch screen. Its ambient light sensor automatically adjusts to changing conditions for the best visibility at all times, and the touch functions are designed to work even when it's wet or you have gloves on. When power is running low, a battery-save mode shuts off the display while still recording GPS location and providing notifications, extending the remaining battery life by up to 50%. 2.3" display. Unit measures 1.9" x 2.9" x 0.8". Claimed weight is 2.4 oz. 15 hour battery life in GPS training mode. Rated IPX7 waterproof. 16 GB internal memory. Bundle includes heart rate chest strap, cadence sensor, speed sensor, standard and out-front handlebar mounts, USB charging cable, tether, and user manuals. The touch screen is not very responsive-sometimes I have to touch the screen many time for it to respond. The HR monitor is better than the old one. I do like the auto upload feature via wifi so my rides get to Garmin Connect and Strava before I even get into the house. Pros Form factor is small compare to the old Edge 810 or the 1000. Built quality is also typical Garmin-which is good. Connectivity is great for all wireless protocols, I love how the rides get uploaded to Garmin Connect and Strava automatically. Seems very accurate with speed, distance and altitude. Battery life has been okay especially if I remember to always turn the unit off after each ride. The HR monitor strap is more comfortable then the old one. Now the cons The resolution of the screen is very low, especially when we are so use to cellphone screens that are 300-400 pixel per inch. The colors of the map reminds me of my TomTom GPS from ten years ago! The maps are also kind of lame on the 2.3 screen. Garmin, you can do better with the screen when you are charging as much as a decent smart phone for the 820. The touch screen is not that great especially with full finger gloves on. I hardly ever change the screen when I am riding. The cadence sensor has a tendency to stop counting revs after a stop and I need to call Garmin about that. Awesome computer. you get everything you need. I purchased the bundle as it brings the heart monitor chest strap which is key to riding long distances. Will measure almost anything, power, heart rate, cadence, time. Easy to pair with power meter. Works really well. I use it for cross country MTB. The GPS signalling is good. I was debating between this and Wahho Elemnt and I like the size of Garmin. I can use gniza site to download segments from Strava and load them to Garmin without Strava premium then race against my PR. Not perfect at all, but very good and virsital. On the bad side, the speaker for using with the Varia to tell when cars are approaching was put in the underside, within the mounting area. It makes the sound way too quiet when out with cars and used with the Garmin out front mount. That said, a third party mount that connects to the steering tube actually improves the hearing of the beeps quite a bit. The fields are adjustable to your tastes. There are lots of add ons including the Varia for detecting on-coming rear traffic. While the touch screen takes getting used to, it does work though sometimes it takes 2 or three taps. On the very bad side, the directions are horrible and LiveTrack which is suppose to allows others to see where you are, doesn't really work at all. As far as that software goes, it is a mess that should not be out in public at this point. hopefully they will correct the problems. It is infuriating that yo pay this much and they don't have that working. If that were working I would give it 5 stars. I bought the 820 to use with the tail light radar unit. This being the case, Im somewhat ok with the 830, but the touch screen is slow to respond as others have noted. Very nice upgrade from my Cateye. I have had this Garmin for a little over a month. Setting up the display screens was very easy. I also like that the cadence and speed sensors don't require a magnet to line up. The one thing that I don't like is that there is not mileage counters for more than one bike. A real plus was that all three sensors in the kit were added to the 820 by the factory. So all you had to do is attach them and everything worked. I am thinking about buying a second one for my wife. Garmin Edge 820 is AWESOME!!! Garmin Connect is AWESOME!!! The touch screen is AWESOME!!! The best thing I like is the gear indication the works with DI2. Great product. Great tech support. Great all around. The Garneb 820 is compact easy to operate and install and I would recommend it. I use this product for commuting and group rides with fellow cyclists. I utilize the various sensor options i.e. cadence, speed and heart. The color display is easy to see and usable. The unit notifies if an incoming call or text is coming in. I wish there was a way to have the message automatically disappear off the screen after a set time. 1) Touch screen response was inconsistent. With bare fingers it usually worked, but with gloves on it was unusable. 2) Couldn't get Wifi to work right on the first unit. 3) Couldn't get bluetooth pairing to work on the second unit. 4) Usually didn't find my speedcadence sensors on start up and had to re-search for them (which is a real pain on group rides with plenty of other sensors within range )). I've since decided that maybe my old Edge 800 isn't so bad after all.